Ethnicity: Roughly 80% of the population is of English descent; another 10% Scottish; with smaller percentages of the population of Welsh and Irish descent. Over 90% of the population is Caucasian. Immigrants from India form the largest minority group, followed by those from Pakistan, the Caribbean, Africa and Bangladesh. Religion: Just over 3 quarters of the population report having a religious affiliation. Of those, 72% identify themselves as Christian. After Christianity, Islam is the most common faith. Other practiced religions include: Hinduism, Sikhism, Judaism, Buddhism and other Christian denominations (i.e. Catholicism). Languages: Although it is not defined in the constitution, the de facto official language of the United Kingdom is English. Other spoken languages include Welsh, Scottish, Gaelic and Ulster Scots. English is typically the language of instruction. Founding Date: Wales officially united with England in the 1500s, Scotland in the 1700s and Ireland in the 1800s. In 1921, the Anglo-Irish Treaty created the Irish Free State; however the 6 northern counties of Ireland remained a part of the United Kingdom and so the country was renamed the United Kingdom of Great Britain and Northern Ireland. Government and Administration: The United Kingdom is a constitutional monarchy and a parliamentary democracy. Since 1999, Scotland, Wales and Northern Ireland have had separate national assemblies that control matters such as education. In England, local governments (i.e. boroughs, counties, cities, districts and council areas) are responsible for matters such as education, social services and elections; however in Northern Ireland, Scotland and Wales, local governments have less responsibility because the national assemblies administer most local issues. The education systems of England, Wales and Northern Ireland share a similar structure, consisting of 6 years of primary school (7 years in Northern Ireland), 5 years of secondary school and 2 years of higher secondary school. At the end of compulsory secondary schooling, students take the General Certificate of Secondary Education (GCSE) examinations. After completing the GCSEs, students may continue their education by taking General Certificate of Education (Advanced Level) courses. These 2-year courses are divided into 2 equal parts: Advanced Subsidiary (year 1) and Advanced 2 (year 2). In general, entry into an undergraduate degree program requires at least 2 General Certificate of Education Advanced Levels, in addition to the appropriate GCSEs. The Scottish education system involves 7 years of primary education, 4 years of lower secondary education and 2 years of upper secondary education. Standard Grades subjects are taken over the final 2 years of lower secondary education. A final examination, administered by the Scottish Qualifications Authority (SQA), is taken at the end of the final year. In addition to, or in place of, Standard Grades, students can also take National Courses. Highers and Advanced Highers subjects are completed by students who choose to take upper secondary education. These courses are the main qualifications required for admission to undergraduate education. Higher Education in the United Kingdom follows a 3-tier degree structure – bachelor’s, master’s and doctoral-level studies. Other possible undergraduate qualifications include: Higher National Certificates and Diplomas, Certificates and Diplomas of Higher Education and Foundation degrees. Graduate qualifications include Postgraduate Certificates and Diplomas, Master’s degrees and Doctoral degrees. A Certificate of Higher Education is typically 1 year in length, and a Diploma in Higher Education is typically 2 years, although some programs (i.e. a Diploma of Higher Education in Nursing) may require 3 years of study. A Diploma of Higher Education may qualify the holder to work in a profession. Credit from the Diploma may also be transferred toward an undergraduate degree. Foundation degrees typically require 2 years of full-time study; however many students choose to complete them through part-time studies. Bachelor’s degrees (England, Wales and Northern Ireland) usually require 3 years of study, though some fields may require 4. Bachelor’s degrees are either honours degrees or ordinary/pass degrees. Honours degrees are studied at a more complex level than ordinary degrees. Professional bachelor’s degrees in architecture, dentistry and veterinary medicine usually take 5 years, while first degrees in medicine may take 5 or 6 years. Bachelor’s degrees in Scotland are different from those in the rest of the United Kingdom. In Scotland, all honours degrees require 4 years of study; whereas the ordinary/general degree, a well-regarded program, requires 3 years of study. Some of the ancient universities call their honours degree a master’s degree (i.e. MA (Hons)) and the ordinary/general degree a master’s (i.e. MA). Postgraduate Certificates and Diplomas usually take 6 to 9 months to complete and are usually taken in a subject closely related to the subject studied as part of the Bachelor’s degree. Master’s degrees, which may be either research-based or taught, require 1 year of full-time study beyond the bachelor’s degree. The Master of Philosophy degree requires 2 years of full-time study. Doctoral degrees, often referred to as PhD or DPhil, require at least 3 years of full-time, or 6 years of part-time, study following a master’s degree. If entry was based on the completion of a bachelor’s degree, students are often enrolled in a 2-year research program (MPhil) before being allowed to proceed to the third year of the PhD program. Technical/vocational education is introduced in secondary school and continues into further and higher education. There is often no clear distinction between general/academic qualifications and vocational qualifications. BTEC Professional Awards, Certificates and Diplomas. Higher National Certificates and Diplomas typically require 1 and 2 years of full-time study respectively. They tend to be more vocational and applied in nature; however credit from either the Higher National Certificate or Diploma may be transferred toward an undergraduate degree. The governments of the United Kingdom recognize the degree awarding powers of universities and colleges. Those institutions that may award degrees are called recognized bodies. They receive their degree awarding powers through a Royal Charter or through an Act of Parliament. All universities and some colleges of higher education are considered recognized bodies. The Department for Business Innovation and Skills maintains a list of recognized bodies. These are institutions which may offer courses leading to a degree, but don’t have the power to award a degree. A listed body must be affiliated with a university or college that has degree awarding powers in order to validate its courses. See the inventory of listed bodies. The main agencies involved in validating, examining and awarding most vocational qualifications are: Edexcel Foundation; City and Guilds; London Chamber of Commerce and Industry Examinations Board; Joint Examination Board; Awarding Body Consortium; Welsh Joint Education Committee; and Oxford, Cambridge and RSA Examinations. General Certificate of Secondary Education (in academic and applied subjects) Completion of primary school (6 or 7 years) 5 years Generally compares to the completion of a High School Diploma (with a minimum of five courses passed). General Certificate of Education Ordinary Level (GCE O Level) (no longer in use) Completion of primary school (6 or 7 years) 5 years Generally compares to the completion of a High School Diploma (with a minimum of five courses passed). Certificate of Secondary Education (CSE) (no longer in use) Completion of primary school (6 or 7 years) 5 years Generally compares to the completion of a High School Diploma (with a minimum of five courses passed with a Grade of 1). Otherwise, the CSE generally compares to the completion of a Certificate of High School Achievement. Advanced General Certificate of Education (GCE A Level) (in academic and applied subjects) Completion of the General Certificate of Secondary Education (or formerly General Certificate of Education Ordinary Level or Certificate of Secondary Education) (11 years) 2 years Generally compares to the completion of a High School Diploma. 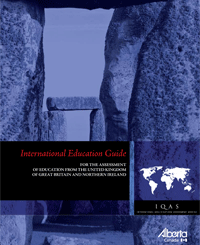 Note: The General Certificate of Education Advanced level examinations are taken following 13 years of combined primary and secondary education and, in combination with the General Certificate of Secondary Education (or previous General Certificate of Education Ordinary level) examinations, give access to university education in the United Kingdom. Some North American universities grant undergraduate transfer of credit for the Advanced level examinations. Scottish Qualifications Certificate (Lower Secondary) – National Courses at Access and Intermediate Levels, and Standard Grades (or any combination thereof) Completion of primary school (7 years) 4 years Generally compares to the completion of a High School Diploma (with a minimum of five subjects passed). Note: Each National Course consists of three units, each of which must be passed at an Access 3 level or above. Scottish Certificate of Education (Lower Secondary) – Standard Grades (no longer in use) Completion of primary school (7 years) 4 years Generally compares to the completion of a High School Diploma (with a minimum of five subjects passed). Scottish Qualifications Certificate (Upper Secondary) – National Courses at Higher and Advanced Higher Levels Completion of lower secondary school (11 years) 2 years Generally compares to the completion of a High School Diploma. Scottish Certificate of Education (Upper Secondary) – Higher Grades (no longer in use) / Scottish Certificate of Sixth Year Studies (Upper Secondary) (no longer in use) Completion of lower secondary school (11 years) 1 year Generally compares to the completion of a High School Diploma. Higher National Certificate No standard admission requirements. Entry requirements may include a BTEC National qualification, GCSE and GCE Advanced level courses (Intermediate or Higher Grade courses in Scotland) or other equivalent qualifications or experience. 1 year of full-time study or 2 years of part-time study Generally compares to the completion of a two-year post-secondary Diploma. Higher National Diploma No standard admission requirements. 2 years of full-time study or 3 years of part-time study Generally compares to the completion of a three-year post-secondary Diploma. Certificate of Higher Education / Diploma of Higher Education No standard admission requirements in England, Wales or Northern Ireland, but generally these have lower requirements than Bachelor degrees. In Scotland, one Higher is required for admission 1 to 2 years Generally compares to the completion of a one-year post-secondary Certificate or two-year post-secondary Diploma. Foundation degree There are no standard admission requirements for Foundation degrees, but these tend to be more flexible than for Bachelor degrees. 2 years of full-time study, though many are completed through part-time study. Generally compares to the completion of a two-year post-secondary Diploma. Bachelor’s degree (Ordinary) (England, Wales and Northern Ireland) No standard requirements, although most Bachelor’s degree programs require a minimum of two Advanced General Certificate of Education (GCE A level) courses with the appropriate General Certificate of Secondary Education (GCSE) courses. 3 or 4 years Generally compares to the completion of a four-year Bachelor’s degree. Bachelor’s degree (Honours) (England, Wales and Northern Ireland) No standard requirements, although most Bachelor’s degree programs require a minimum of two Advanced General Certificate of Education (GCE A level) courses with the appropriate General Certificate of Secondary Education (GCSE) courses. 3 or 4 years Generally compares to the completion of a four-year Bachelor’s degree (honours). Bachelor’s degree (Ordinary) Scotland There are no standard admission requirements, but in general, admission to a Bachelor’s degree programs is three Highers. 3 years Generally compares to the completion of a three-year Bachelor’s degree. Bachelor’s degree (Honours) (sometimes called a MA (Honours)) Scotland There are no standard admission requirements, but in general, admission to a Bachelor’s degree program is three Highers. 4 years Generally compares to the completion of a four-year Bachelor’s degree. Bachelor of Education No standard requirements, although most bachelor’s degree programs require a minimum of two Advanced General Certificate of Education (GCE A level) courses with the appropriate General Certificate of Secondary Education (GCSE) courses. 3 or 4 years Generally compares to the completion of a four-year Bachelor’s degree. Bachelor of Nursing No standard requirements, although most Bachelor’s degree programs require a minimum of two Advanced General Certificate of Education (GCE A level) courses with the appropriate General Certificate of Secondary Education (GCSE) courses. 3 years (4 years in Scotland) Generally compares to the completion of a four-year Bachelor’s degree. Diploma of Higher Education in Nursing Generally, diploma program requirements are lower than degree programs. They usually include a minimum of five GCSEs (or the equivalent Highers from Scottish students) or other comparable qualifications. 3 years Generally compares to the completion of a three-year post-secondary Diploma. Bachelor of Medicine (Bachelor of Medicine and Bachelor of Surgery) No standard admission requirements, although most programs require a minimum of three GCE Advanced level courses with the appropriate GCSE courses, or the equivalent combination of Highers and Advanced Highers from Scottish students. 4 to 6 years depending on entry requirements / credentials Generally compares to the completion of a first professional university degree in medicine. Bachelor of Engineering (includes Master of Engineering) No standard admission requirements, although most programs require a minimum of two GCE Advanced level courses with the appropriate GCSE courses, or the equivalent combination of Highers and Advanced Highers from Scottish students. 3 to 5 years Generally compares to the completion of a four-year Bachelor’s degree. Note: If this was a sandwich degree program an additional one year of co-op experience is acknowledged. Postgraduate Certificate / Diploma Bachelor’s degree 6 to 9 months Generally compares to the completion of a graduate Certificate / Diploma. Master’s degree Bachelor’s degree (Honours) 1 year full-time or 2 years part-time Generally compares to the completion of a Master’s degree. Master of Philosophy degree Bachelor's degree (Honours) 2 years full-time or 4 years part-time Generally compares to the completion of a Master’s degree. Doctorate degree Graduate degree (usually a Master’s degree) At least 3 years of full time study Generally compares to the completion of a Doctor of Philosophy (PhD) degree. These templates give detailed information on educational credentials awarded for programs of study completed in the United Kingdom.